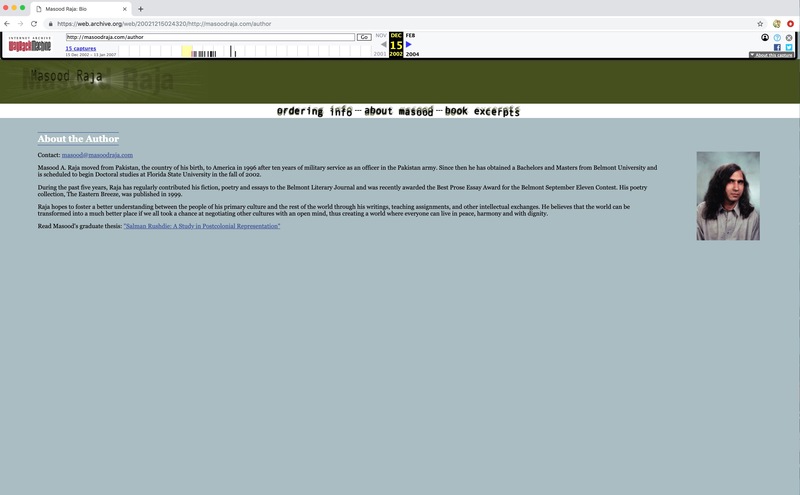 Launched as an author website in 2002, as masoodraja.com, this site has now developed into an academic resource for Dr. Masood Raja’s students and all others interested in Postcolonial Studies. While some pages on this website are specifically meant for Raja’s students, most other scholarly and academic content is available as an open resource to a global audience of scholars and students. The Postcolonial Space is an open resource for all those interested in Postcolonial Studies. Please feel free to contact us with your suggestions or questions. If you are planning a conference, an edited volume, or a Journal Issue and would like to post your Call for Papers on this website, please submit your CFP and we will post it on our Blog. Masood Raja moved from Pakistan, his native country, to America in 1996 after ten years of military service as an officer in the Pakistan army. Raja earned his Masters from Belmont University and his Ph.D in Postcolonial Literature from Florida State University. Raja hopes to foster a better understanding between the people of his primary culture and the rest of the world through his writings, teaching assignments, and other intellectual exchanges. Author of several books, Masood Raja is an Associate Professor of Postcolonial Literature and Theory in the English Department of the University of North Texas and the editor of Pakistaniaat: A Journal of Pakistan Studies. Dr. Raja maintains this website in his spare time and would welcome any suggestions for improvement of the site and its content. Please feel free to contact us.